Your tires are an important investment and an integral part of what keeps you safe and sound on the road. At Silver Lake Auto & Tire Centers it is important to us to keep your tires in tip top shape! Take a look at our tire protection plan, honored at over 30,000 locations nationwide! This road hazard plan is made by the Independent Dealer from which you purchased the tires. This limited road hazard protection applies to the tires, original purchaser and the original vehicle identified on the purchase receipt. This limited road hazard protection only applies to passenger and light truck tires, which during its tread life or within the covered period of time, becomes unserviceable because of a road hazard. The road hazard protection is optional protection that must be purchased and must appear on your receipt. This road hazard plan is not a plan of U.S. Auto Force or Automotive Business Solutions, Inc., or their affiliates, subsidiaries, their employees or member companies. Automotive Business Solutions, Inc. serves as the administrator only. A road hazard occurs when a tire fails due to a puncture, bruise or break incurred during the course of normal driving on a maintained road. Nails, glass and potholes would be the most common examples. If within 10 miles of the original facility, you MUST return to the facility where you originally purchased the plan. If you are further than 10 miles from the original facility, contact the program administrator by calling 800-457-0203 for assistance in locating the nearest participating facility. Tire is covered from any damage for 3 years, or until tire is worn to 2/32” tread depth. Also included, free tire rotations and balancing for the life of the tires. This is the greatest value for our customers. We suggest rotations every 6,000 miles. YOU MUST PRESENT THE ORIGINAL INVOICE SHOWING THE PURCHASE OF THE TIRE(S) AND THE ROAD HAZARD PLAN. Prior authorization must be obtained to replace a tire damaged by road hazard. The damaged tire must be made available for inspection by the facility and/or the program administrator. All claims and any required documentation must be submitted to the facility or the administrator within 60 days of the date of failure and/or service. Tire Replacement: If a tire becomes unserviceable because of a road hazard during the useable tread life of theire, it will be replaced with a new tire. If available, an exact make/model replacement tire will be installed. If not available, a comparable quality tire will be installed. If the tire failure occurs within the first 25% of useable treadwear, and cannot be safely repaired per manufacturer’s guidelines, the tire will be replaced with coverage up to 100% of the original price paid for the tire. After the first 25% of the useable treadwear you will be charged for the consumed useable treadwear on the original tire, times the original selling price of the tire. Treadwear is determined by measuring the tread depth of the tire with a proper gauge. You will be responsible for any taxes, mounting, balancing, and any other miscellaneous fees. When tread is worn down to 2/32” the tire is considered worn out and is not eligible for adjustment. If you want road hazard coverage on the replacement tire, you must purchase road hazard protection for the new tire. Tire Repair: If your tire is damaged due to a road hazard and can be safely repaired the tire will be repaired per manufacturer’s guidelines at any participating facility. The repair will be provided to you free of charge if performed by the original facility that sold you this plan. If the repair is performed by another facility, the plan will cover up to $20.00 to have the tire repaired. The road hazard coverage will remain in effect until the tire is worn to 2/32”. The following vehicles are not eligible for coverage: Vehicles with a manfactureer’s load rating capacity of greater than 1 ton. Commercial vehicles. Coverage excludes damage from off-road use, collision, fire, vandalism, theft, snow chains, manufacturer’s defects, abuse and neglect (i.e., improper application, improper inflation, overloading, brake lock up, wheel spinning, torque snags, etc. ), cosmetic damage, sidewall abrasions or other appearance items that do not affect the safety or performance of the tire. Tire with a torn bead. Also excluded are damages or irregular wear caused by misalignment, mechanical failures or interference with vehicle components, tires that have been repaired in a manner other than per manufacturer’s guidelines. This plan covers only the lines registered to the customer and listed by DOT number on the original invoice. CONSEQUENTIAL AND INCIDENTAL DAMAGES ARE EXCLUDED. Some states do not allow the exclusion or limitation of consequential and incidental damages, therefore such limitation of exclusion may not apply to you. No expressed guarantees given other than that stated herein. This protection plan gives specific legal rights, you may have other rights which may vary from state to state. 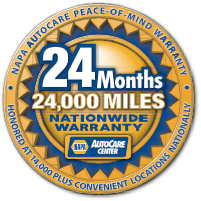 We are proud to offer the NAPA Nationwide Warranty to offer you peace of mind while you’re on the road! Honored at over 14,000 location nationwide! This limited warranty is extended only to you, original purchaser, and not to anyone who may purchase your vehicle from you during the term of the warranty. This limited warranty is made by the Independent Repair Facility (“Dealer”) __________________________________________________________________. who is so named on the original repair order, and whom performed the service/repairs on your vehicle. This warranty will be honored by any NAPA AutoCare Dealer participating in this program, or any other authorized repair facility anywhere in the United States. This warranty is not a warranty by National Automotive Parts Association (NAPA), its employees, jobbers, member companies, or the administrator, Sonsio Administrative Services, Inc., its affiliates, subsidiaries or any of their employees, or member companies. Sonsio Administrative Services, Inc. serves as the administrator only. Engine performance, drivability services and repairs. Electronic engine management system and other on-board computer systems, (engine, body, brake and suspension computers), cruise-control systems. Steering/suspension systems, wheel bearings, CV joints / U-joints, half-shafts and drive shafts. We extend that to 36mo/36,000 miles when warranty repairs are done at our facility. The Independent Repair Facility warrants that the above repairs and services performed at their location will be free from defects in materials and workmanship for 24 months or 24,000 miles of use, whichever comes first, measured from the date of the first repair and the odometer reading shown on the original repair order. This warranty is conditioned on the vehicle being subjected only to normal use and receiving reasonable and necessary maintenance during the warranty period. Warranty repair costs shall in no case exceed the costs of the original related repair or service. If there is a defect in either materials or workmanship within the warranty period, the Independent Repair Facility shall have the option to either perform remedial service work at no charge to you, replace the defective warranted part(s) without charge to you, or refund to you the entire charge for the warranted repairs, minus any previous refunds or credits. STATE OF CALIFORNIA ONLY: A buyer of covered products or services has the right to have warranty service performed during the warranty period. The warranty period will be extended for the number of whole days that the vehicle has been out of the buyer’s hands for warranty repairs. If a defect exists within the warranty period, the warranty will not expire until the defect has been fixed. The warranty period will also be extended if the warranty repairs have not been performed due to delays caused by circumstances beyond the control of the buyer, or if the warranty repairs did not remedy the defect, and the buyer notifies the warranty administrator of the failure of the repairs within 60 days after they were completed. If, after a reasonable number of attempts, the defect has not been fixed, the buyer may return his vehicle for a replacement of parts, if applicable, or a refund, in either case, subject to deduction of a reasonable charge for usage. This time extension does not affect the protections or remedies the buyer has under other laws. If you are less than 25 miles away from the original repairing NAPA AutoCare Dealer location, you must return your vehicle to the NAPA AutoCare Dealer location where the warranted service was performed and present your copy of the repair order to the Dealer. If your vehicle is inoperable, and you are more than 25 miles away from the original repairing NAPA AutoCare Dealer location, you may be eligible for certain towing and/or rental car benefits as determined by the Administrator. If you are not aware of a participating NAPA AutoCare Dealer location in your area, then you must call the Administrator, at (800) 452-NAPA, from 8:00 a.m. to 8:00 p.m. Monday through Friday (Eastern Time) and 8:00 a.m. to 5:30 p.m. Saturday (Eastern Time), excluding holidays. The Administrator will direct you to the nearest participating NAPA AutoCare Dealer location. If there are no NAPA AutoCare Dealer locations in your area, the administrator will direct you to a non-NAPA AutoCare Dealer location. You must keep a copy of the repair order and present it when seeking service under this warranty. If warranty work is performed, you must temporarily surrender possession of the repair order. If there are no participating locations in your area, you must obtain authorization from the Warranty Administrator prior to any warranty repair work by calling (800) 452-NAPA. If the non-participating Repair Facility location will not accept payment from the Administrator, you must pay for the warranty service and submit a legible copy of your original repair order and warranty service repair order to the Administrator for consideration for reimbursement under this warranty. You must pay for any non-warranty service you order to be performed at the same time as the warranty service. This warranty will not apply to your repaired vehicle if it has been damaged by abnormal use, misuse, neglect, accident, alteration or “tampering with” (by other than the Facility or Facility employees). The Facility’s employees and/or agents do not have authority to modify the terms of this warranty nor to make any promises in addition to those contained in this warranty. This warranty does not in any way include INCIDENTAL OR CONSEQUENTIAL DAMAGES (additional expenses which you may incur as the result of faulty repair or service) or cover parts and labor due to normal wear and tear. Automatic – any internal repair or component replacement. Manual – any internal repair or component replacement. Oil changes, fluid changes and flushes, wiper blades, filters. NAPA AUTOCARE “PEACE OF MIND” NATIONWIDE WARRANTY, P.O. Box 17659, GOLDEN, CO 80402-6027 1-800-452-NAPA. Warranty Coverage period is extended to 36 months or 36,000 miles when qualifying repairs are paid for with the NAPA Autocare Easy Pay Card (not applicable to commercial vehicles).